Everything Just So: Wishing You A Glamorous 2016! Wishing You A Glamorous 2016! A Schlumberger for Tiffany & Co. “Hedges and Rows” necklace. Photo courtesy of Christie’s. I want to wish you a wonderfully glamorous 2016 filled with good times, prosperity, and a lot of beauty! Speaking of which, now that I have been bitten, many times over, by the fine jewelry bug, I wanted to share this completely over-the-top Jean Schlumberger for Tiffany & Co. “Hedges and Rows” necklace that was recently on the auction block at Christie’s as part of their “Magnificent Jewels” sale on December 10, 2015. 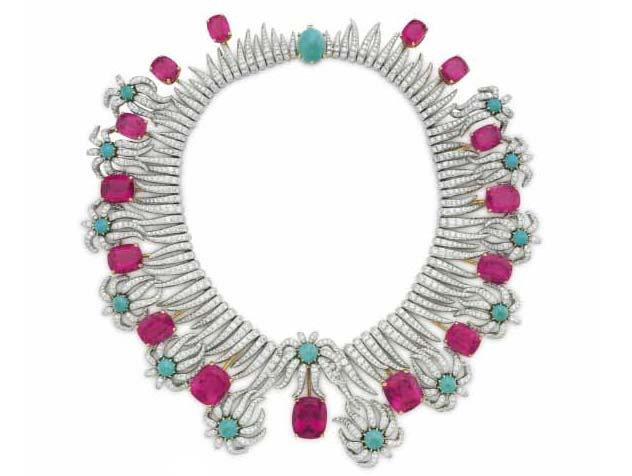 The necklace was from the estate of Carroll Petrie and is made of diamonds, turquoise cabochons, and cushion-cut rubellite tourmalines, all set in platinum and 18 karat gold. Stunning! The design was first introduced in 1960 but the auction notes do not say what year this version was created. The estimate on this necklace was $200,000-300,000 but the final hammer price was $905,000. Wowza. I guess the economy is still okay for the 1 percent! Just like the blue-haired mannequin above, I raise my glass to you and your happiness and health in the coming year! I also wish you many opportunities to wear sequins and feathers and red lipstick and long lavender gloves! And to you Jill! May 2016 be full of joy and new adventures!! Jill, just saw the BG windows - beautiful as usual. May 2016 bring you health, love & lots of sparkle. :-) This necklace is too good to be true. And you're so right - to that 1 percent out there $10000000 doesn't matter at all. HAPPY New Year to you, too, dear Jill! Happy New Year Jill! I think you may need to moonlight as a Cat Burglar to support this new obsession....should we expect an EJS paywall soon?